At only 3 cm long these earrings can make a great statement. They give off a slightly hieroglyphic vibe to them with the gold swirl in the black but are modern and contemporary with the silver disc. This fusion creates a bold and fun pair that will always generate a compliment. This necklace is beautifully simple, mainly featuring a sphere that has a marble pattern and texture to it. This is a elegant necklace that could be a quiet addition to an outfit or the main piece. This necklace is of medium length and sits just below the collar bones. These beads are as black as the darkest night you have seen yet hold the light like a diamond. This bracelet is cleverly designed to be subtle and simple but have the ability to sparkle when moved. This is an easy addition to any outfit. This funky necklace can liven up any outfit put with it. The squares and circles are soft in shape yet bright and vibrant. 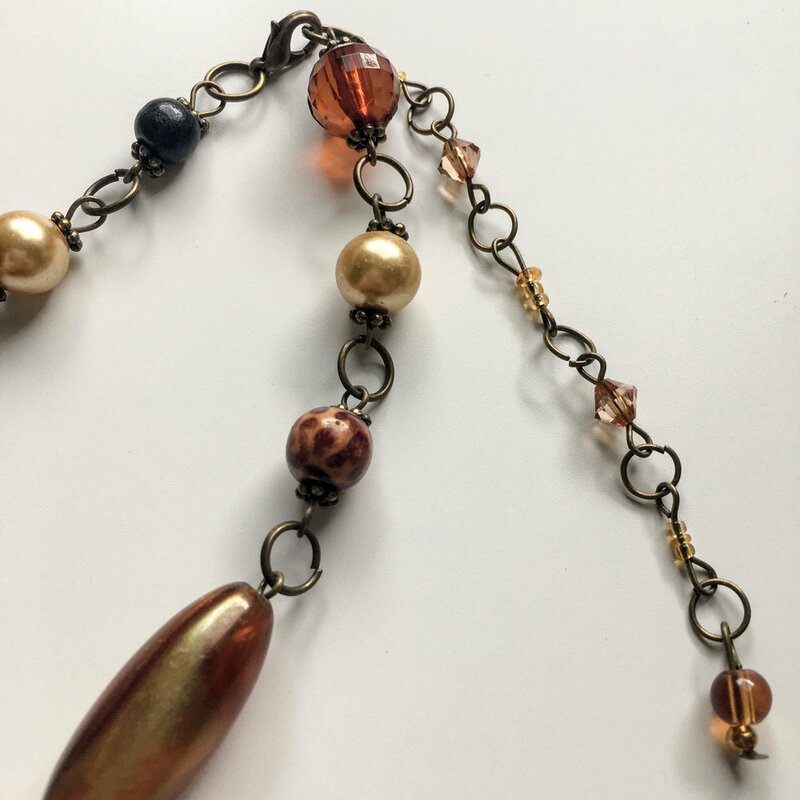 This necklace is long and brings lots of fun elements to it allowing for the chance to wear it with many different colours and patterns. Light capturing deep sky blue disks are gently anchored by a gorgeously designed metal cross that reflects the sun. Beautiful for any season. This design has earthy tones and reminds the staff of stories and images of fairies they had heard and seen when they were young. It sits just below the collarbones and adds intricate beauty to any outfit. 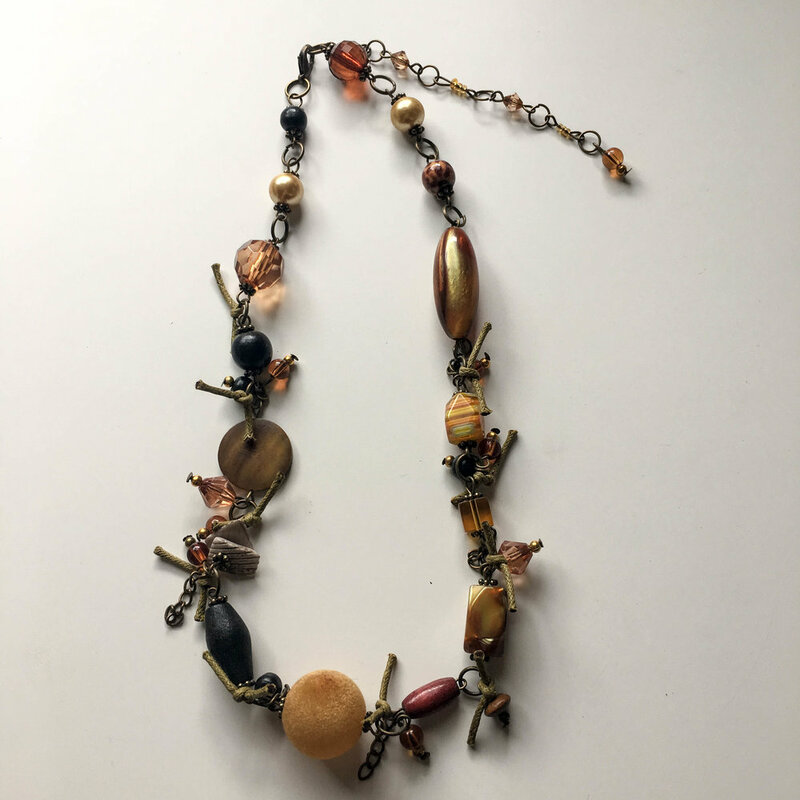 The necklace has a natural feeling and looking elements as if a little creature in the woods provided the material for use, allowing a harmonious relationship between the jewelry and nature which creates a uniquely beautiful necklace. This keychain is just over 10cm long and light in weight. Would make your keys easy to find and hard to leave behind. Attached are gorgeous beads and metal charms. This key chain is durable and simply clicks onto your key ring. This one off pair of earrings would look gorgeous on any skin tone or hair color. The light and dark shades of green playfully contrast with each other allowing a stunning but not over dressed piece of jewelry. These could easily be worn any day of the week or dressed up for an occasion. Gorgeous bracelet that would suit every day wear or for a specific nights theme. The beads have that 'lived in' look that ages them and makes it look like they have lived through many eras. The chain and clip allow it to fit to any size wrist, tight or loose. While this bracelet is funky it also conveys elegance and will be a great addition to your collection. This necklace is the perfect piece for an outfit that needs color and texture without being overwhelmed. 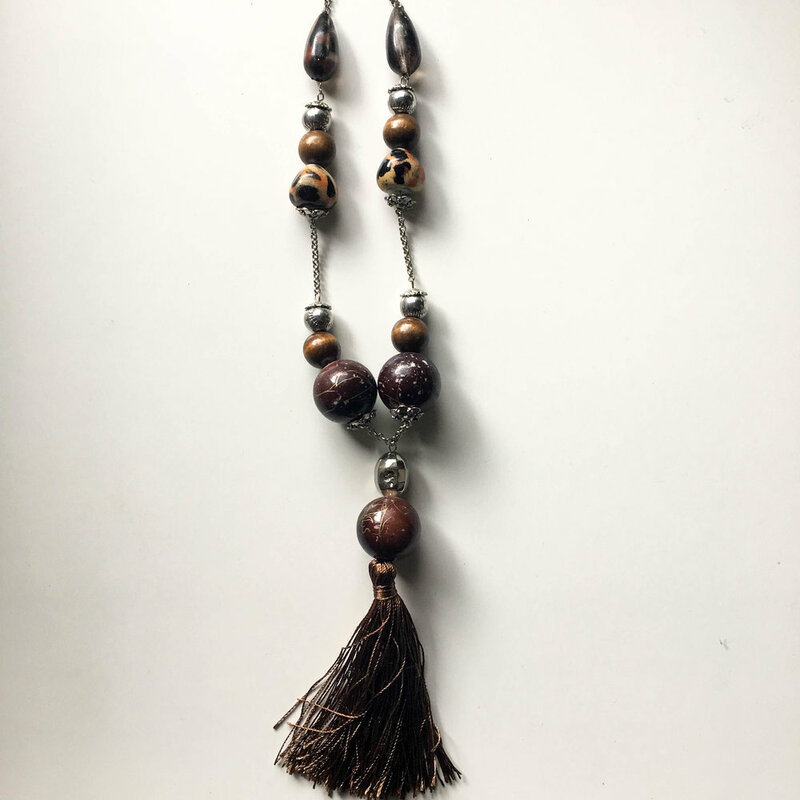 This long necklace has gorgeous beads that allow for a subtle pop of color while elongating your torso before reaching a sleek tassel at the bottom for a splash of texture. It can easily become an essential to your weekly wear, casual or dressed up!